We are a leading Manufacturer of concrete wheel barrow from Faridabad, India. We are a renowned manufacturer if a line of durable and reliable construction wheelbarrow. 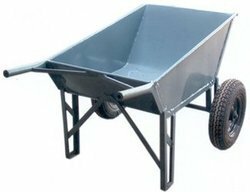 Our Concrete Wheel Barrow are specially designed for efficient transportation of concrete. Made from highest quality raw materials, these wheel barrows are specially designed according to the specific needs of our clients. Our line of wheel barrows are well appreciated for their good balance, strength, durability and excellent design. These heavy duty wheel barrows can lift excessive loads with ease.